Your Penthouse Paradise Awaits! Breathtaking views! Walk into Cruz Bay! Pool! Elegant Penthouse Condo with 3 bedroom, 3 bath & Amazing Sea Views! Mango Mojo is a newly remodeled 3 bedroom 3 bath condo that screams luxury! Perched on the hilltop of this quaint residential neighborhood you will find the perfect setting to let the stress of life drift away into the sea. From the moment you enter the condo it is apparent that the owners have spared little expense in making this the perfect vacation property for you and your family. All of the modern furnishings are centered on making you comfortable from the padded barstools, plush living room furniture, fine linens and towels to the black out curtains for those who enjoy sleeping in past sunrise. The fine finishes in this property are sure to impress, you may not even leave the condo. The open floor plan of the kitchen and living room offer amazing views of the caribbean sea. Looking south on a clear day St Croix is visible and moving westward, views of French Cap, Dog Island, Little St James, Greater St James and St Thomas and of course the many colors of the amazing Caribbean Sea come to life. If you are like us you will find it difficult to take your eyes off of the view and enjoy sitting on the open deck watching the many boats cruising by and wonder " where could they all be going?" Maybe you'll even book a charter yourself! The Master bedroom has an ocean view from the four poster king bed and an en suite bath with double sinks. There is also abundant closet and drawer space in case you are packing more than flip flops and bikinis or have a special event like a wedding that requires a few more necessities. The 37 inch wall mounted flat screen is perfectly positioned for viewing from the bed and won't strain the neck. The second master suite two queen beds with pillow top mattresses and an en suite bath and is great for children, young adults or couples that don't mind sharing the space. This room also is equipped with a 37 inch wall mounted flat screen TV. The guest bedroom has a beautiful queen bed with a pillow top mattress and has a full bath located just outside its door. A wall mounted flat screen TV is in this room as well, just above the closet and is perfect for those late night ball games or chick flicks just before fading off into slumber. The pool is a very large 16X24 ft pool. Enter the pool at the steps or jump in from the side, but please do not dive as the pool is only 5 ft deep at its deepest point. The pool is shared with only 5 other units. It is a great place to chill out after the beach and meet other vacationers from all parts of the world. But don't worry about it being crowded, the sun deck is spacious and there are several lounge chairs and a great gathering table for sitting and visiting. The condo has off street parking for 1 vehicle at the front of the property and there is space along the street for additional parking. We are located on a hill and the parking may take a little getting used to but it is safe, we are on an island you know? You can't get these views from bottom. It is a short 10 minute walk to many of the fine dining establishments and shopping here in Cruz Bay and most guests stroll down Frangipani lane to Bay Street and into town. There are a couple of steep hills along the walk so we do recommend a rental car or safari taxi for those with mobility concerns. Frank Bay and Turner Bay are a 5 minute walk and offer great snorkeling, swimming and beach combing activities. The Virgin Islands National park covers 70% of St. John and is located just north of Cruz Bay. You can access the hiking trails and many beaches with just a 10-15 minute drive, giving you more time at the beach and less time with transportation. Beach towels, back pack beach chairs, and coolers are provided for each and every guest and don't worry about packing snorkel gear. There are plenty of businesses here that rent fins and masks, stand up paddle boards, and ocean kayaks at very affordable prices. Just ask and we will get you the information. This property is perfect for families, couples getaways, girls escapes, romantic retreats, family reunions and wedding parties. Welcome to our slice of paradise, Mango Mojo! The owners of Mango Mojo hail from the east coast of the U.S. -- Dave is originally from Maine, and Sharon from Virginia. We currently live in Reston, VA. We've been blessed to be able to travel far and wide. Sharon always falls in love with the location and wants to buy a place, and Dave always says NO! St. John was the first place that Dave not only said YES, but it was his idea!!! :) We have amazing on island managers - Dave and Julie - who are right down the street from Mango Mojo and take exceptional care of our guests. We have been to other islands in the Caribbean, and were married on Virgin Gorda back in 2002. 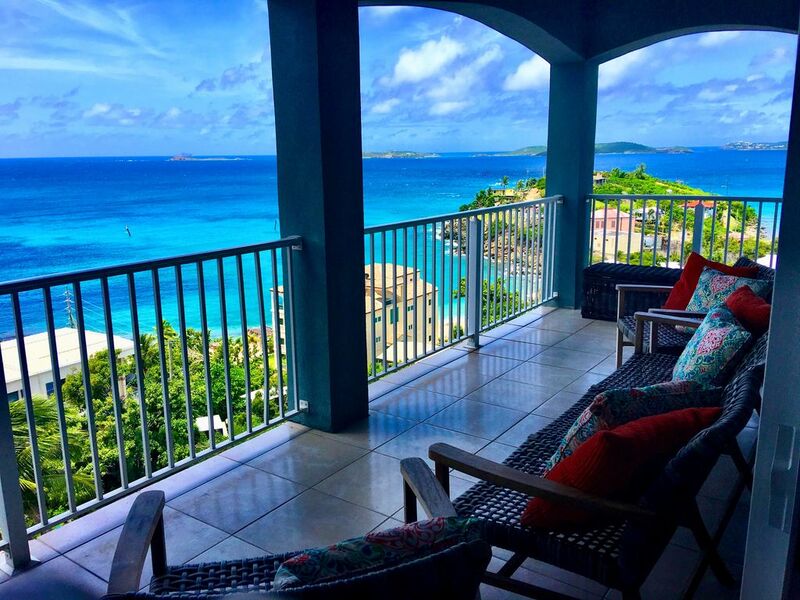 We didn’t visit St. John until 2014, and immediately fell under its spell! The warm and friendly people, the stunning beaches and crystal clear waters, the turtles (love swimming with the turtles)! The relaxed vibe and great restaurants. The lush, unspoiled natural beauty protected by 7,000+ acres of National Park. We hope that you delight in this amazing jewel of an island, and our condo, as much as we do. It truly is a special place. We purchased this condo in 2016, and put our heart and soul into completely transforming it into an elegant and comfortable home away from home. We made it exactly as we would want it, and are pleased to share it with you. We love many things about this specific location: the ability to walk to the many restaurants, shops and services in town, yet still be in a peaceful and quiet neighborhood; the intimate size of the condo complex and lovely pool; the soaring cathedral ceilings and hilltop breezes of the penthouse unit and the spacious layout. But what ultimately sold us are the VIEWS! Two private balconies offer a spectacular perch for watching breathtaking sunsets, brilliant starry skies, glittering cruise ships at night on their way to southern ports of call, and ferries as they traverse in and out of Turner Bay. It's mesmerizing. We named Mango Mojo after our sweet cat Mojo. The black cat print in the master bedroom reminds us of him and makes us smile. We hope you enjoy our happy place. Dining table seats 8, plus 4 comfortable bar stools at the kitchen island. The house was awesome. Would definitely recommend staying here. Close to town with great view of the water. Had an awesome time at Mango Mojo. Vacationed with 3 couples and a toddler. The 3 bedroom unit is well appointed. Great setup with each room having their own private bathroom. The kitchen had everything you needed if you wanted to cook at home. We mainly just ate breakfast there as we were out on the island all day otherwise. The welcoming basket on the day we arrived was very thoughtful as we were all hungry from a long day of travel. Shannon met us at the property upon arrival and was very helpful and informative. The beach chairs, floating noodles, and snorkeling masks were also utilized every day. I would definitely come back and recommend this property to anyone traveling to the island. Thank you for letting us enjoy your beautiful property. This was our eighth trip to STJ and fourth villa. As long as this condo continues it's very high standards, we will never stay anywhere else. We cooked most meals at home and the kitchen is fully stocked (except a grill would have been helpful). All furnishings were top of the line- pottery barn, arhaus, etc. The beds and pillows were incredibly comfortable. The pool was fantastic. Plenty of beach chairs and a fantastic cooler! Management company was a text away and very responsive. We only walked to town once and it was a quick walk. Penthouse was beautiful. Views amazing. The pool was great with an a great view as well. It would have been nice to have another key. We only had one key for 3 couples. Quite a hike to get up the hill only downfall. Had to take a taxi when we had our luggage. Usually took a taxi to get home at night. Great location and amazing island! The place was beautiful! It was so clean and fit our family perfect. Great location where we could walk to town. Highly recommend. We would go back in a min! Only complaint is there was no blender and the water pressure wasn’t great. We are so glad that you stayed with us at Mango Mojo and appreciate a well decorated and clean property. The views of the Caribbean Sea are spectacular from the decks and we enjoy frozen margaritas there often. We keep a Ninja Blender there for our guests to use. We are sorry you didnt see it or know that was our blender. Feel free to contact Dave and julie our on island managers should you need anything during your stay. They respond quickly and can take care of last minute needs or items. Thanks again for leaving us a review! The $50 damage insurance fee is non refundable.